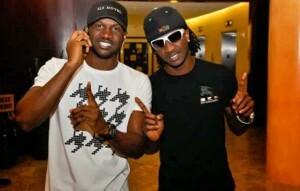 Home Entertainment Celebrity News Peter Okoye No Longer Part Of P-Square? Peter Okoye No Longer Part Of P-Square? After several disputes, the duo of Paul and Peter Okoye who are widely known as P-Square, have reportedly gone their separate ways. Though the tale of a sinking relationship between the twin brothers began again following cryptic passive aggressive posts on their social media handles, they have reportedly ended their popular relationship. According to reports, Peter has chosen to terminate his contractual agreement between the group saying he won’t betray his wife and kids for the group. We hear Peter has said his twin brother, Paul and elder brother, Jude, had seemingly severed ties with him despite his efforts to make their relationship work. Reports also said Peter had written to the group’s lawyer, Festus Keyamo demanding for the termination of the agreement between the group – P-Square. He also reportedly accused Paul of blasting both his wife and kids on social media. He added that they have been receiving threatening messages. Peter also accused Jude of threatening to shoot his wife, Lola, in the presence of Paul, and the former first lady of Cross Rivers state Obioma Liyel-Imoke.